Helsinki used more coal in 2016 than in the previous year, causing carbon dioxide emissions to go up by one percent. For a city that has pledged to make itself carbon-neutral by 2035, it is a small step in the wrong direction. The city of Helsinki pledged this autumn to do one better than the rest of Finland and be carbon-neutral by 2035. 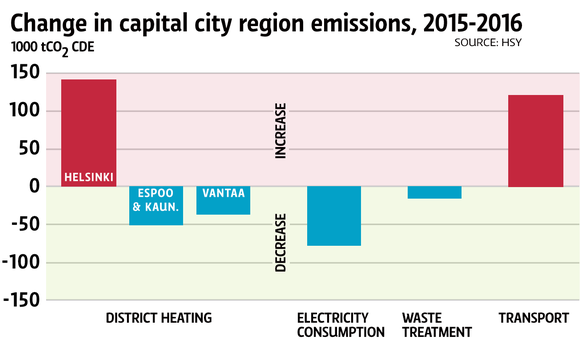 But last year greenhouse gas emissions in Finland's capital actually went up. Statistics from the Helsinki Region Environmental Service Authority (HSY) show that CO2 emissions and their equivalent were higher in 2016 than in 2015. The reason for the growth can primarily be attributed to two factors: a larger reliance on coal for district heating and an increase in traffic emissions. HSY's director Raimo Inkinen says district heating presents the largest future concern. It already accounts for 44 percent of the capital region's emissions, with the second-largest offender, transport emissions, at 28 percent. 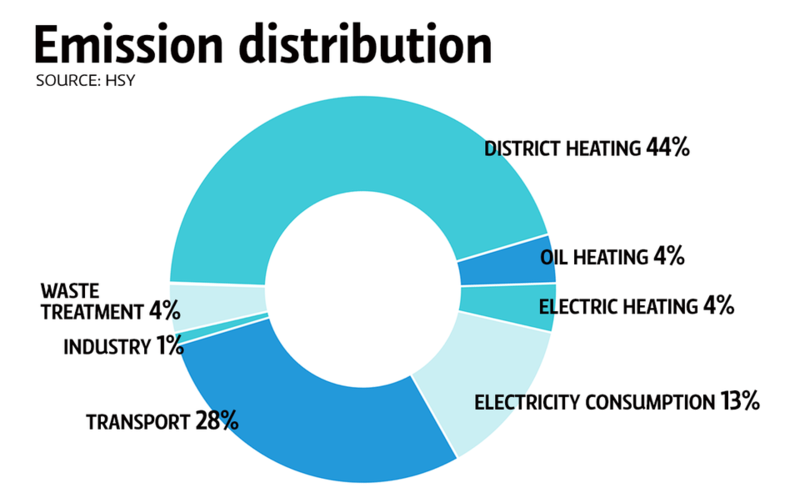 The size and number of Helsinki's power plants is measured in line with what is required to keep its residents toasty warm in their homes during cold spells. These days, winter temperatures tend to hover around the freezing point, so energy companies can decide freely which of their available options to use. Most of the plants in the capital city area rely on coal or natural gas, and the latter choice gives off lower emissions. But things changed in 2016, when energy company Helen's long-term agreement providing it with a source of cheap natural gas ended. "It's awkward for us in terms of our climate goals, but unfortunately this is what happened," says the city of Helsinki's environmental centre director Esa Nikunen. Helsinki has already decided to close down one its coal-fired power plants in 2024. Now the race is on to find more environmentally-friendly and cost-effective alternatives. But what about the second-largest offender? Traffic emissions were up in 2016, but not because there were more vehicles on the road. It was because a lower percentage of biofuels was added to petrol and diesel in Finland than in the previous year. In 2015, Finland reached an agreement with the European Union to limit the proportion of biofuels that could be mixed into fuels to 8 percent. Before this time, it had been the practice to use a higher percentage. Despite a higher limit of 10 percent in 2016, refineries lowered the mix – for example, the biofuel percentage in diesel fell from 17 percent to 4 percent in this time. Regulations may control the amount of biofuels that can be used, but cities themselves can also have considerable say over how their residents consume petrol and diesel. HSY's Inkinen and Helsinki's Nikunen agree that implementing congestion charges for road use during rush hours would be a wise choice. In February of this year, Minister of Environment Kimmo Tiilikainen claimed that Finland could meet its Paris Climate Accord goals by the year 2045. This autumn, Helsinki upped the ante and made a pledge to achieve the goal ten years earlier. This means that the city plans to cut emissions by 80 percent from 1990 levels. Although news of the 2016 increase will likely lead some to demonise Helsinki, the overall picture is still rosier. Among the capital city region's residents, Helsinki natives have the lowest carbon footprint per capita. But Helsinki is not alone in this surprise uptick. As was reported in November, coal consumption grew everywhere in Finland in 2016, largely because figures from 2015 were exceptionally low.